Is There A Bright Future For Bright Automotive? Un-plugged for now: the Bright Idea. What appeared to be a bright future is now a bit more cloudy for Bright Automotive, one of the many start-ups hoping to capitalize on the growing interest in electric vehicles. Launched in January 2008 by the Colorado-based Rocky Mountain Institute, Bright seemed poised to be one of the first makers to come to market with a competitive battery-electric vehicle, or BEV. But battered by the recession and the tightening of the money markets, the spin-off has retrenched and is rethinking its strategy, but Bright still hopes to become a contender in the potentially lucrative electric vehicle market, contends its new chief operating officer. “We had to hit the pause button on our production program,” acknowledges Mike Donoughe, who signed on as Bright’s CEO in August. The firm had been hoping to carve out a niche in what many believe will be the most promising segment of the battery-car market with the Bright Idea. 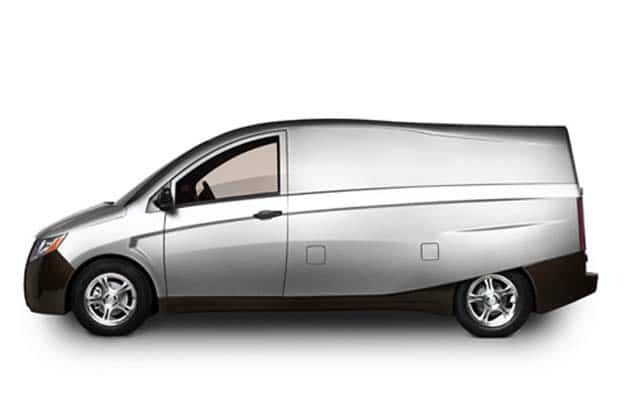 The plug-in hybrid delivery truck, which was previewed at the 2010 Washington Auto Show, was slightly larger than the Ford Transit Connect, a pure battery-electric offering that is just going into field testing. The Bright Idea reportedly would have gotten 100 miles per gallon but, perhaps more importantly, been able to handle much of a customer’s daily duties on battery power alone. The fuel savings, Bright was betting, would have made it a perfect fit for delivery fleets. Bright was also looking at the use of pure battery power, and was given one of five contracts by the U.S. Postal Service, which would like to find a way to reduce the hefty fuel costs of maintaining one of the world’s largest vehicle fleets. The potential fleet market for battery vehicles was underscored, two months ago, when General Electric announced it would replace at least half of its huge sales and service fleet with battery-powered vehicles, including the new Chevrolet Volt. The Postal Service “shake-down testing” continues, though Donoughe says Bright is going back to the drawing board with the Bright Idea. And until it can come up with a solid business case – and a re-engineered product, the start-up is focusing on the consulting side of its operations. It launched Bright eSolutions to consult on technology related to battery propulsion and won a contract from the U.S. Army Tank Command, or TACOM. A critical step in the process would be the approval of a Department of Energy loan, which would come from the same program that has helped subsidize big players, like Nissan, as well as competing start-ups Tesla Automotive and Fisker Motors. Meanwhile, Bright has gotten an endorsement from General Motors, the maker’s investment arm, General Motors Ventures, having pumped in $5 million earlier this year. Could a closer relationship between the two companies be in the works? “There are opportunities, but no tie-up at this point,” says Donoughe, a 25-year Detroit industry veteran who joined Bright Automotive after a brief tenure with Tesla. Nonetheless, Bright expects to get not only cash but access to GM technology. Several observers suggested things very well could progress to a more formal partnership, pointing to the strategy Ford has taken to bring its own electric vehicles to market. The Transit Connect Electric, in particular, is the result of a joint effort involving Ford, Canadian-based Azure Dynamics – which oversees the project – and AM General, which is producing the battery vehicle. How soon could Bright get its vehicle program back in gear? Donoughe declines to provide a timetable, noting how that has tripped up other ambitious start-ups. But an order from the Postal Service or a big bucket of cash from the DoE would certainly kick-start its efforts. This entry was posted on Friday, December 17th, 2010 at and is filed under Automobiles. You can follow any responses to this entry through the RSS 2.0 feed. Both comments and pings are currently closed.